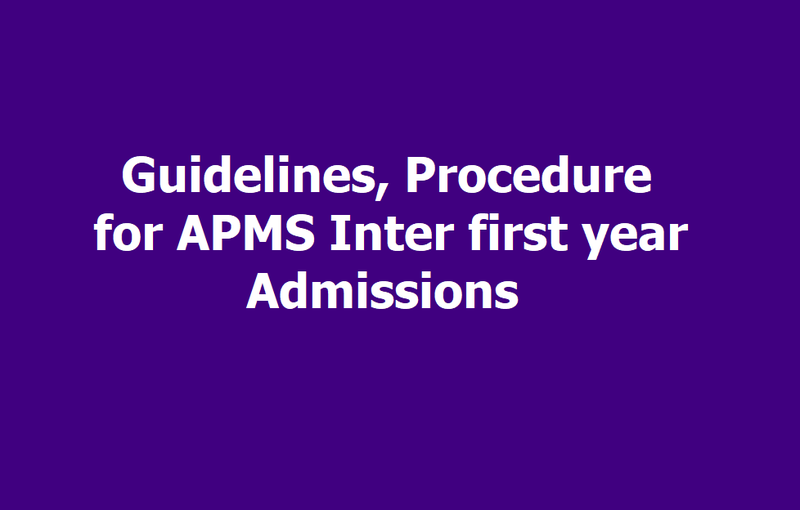 Guidelines, Procedure for APMS Inter first year course admissions 2019: Procedure and Guidelines for Admission in to First year intermediate course in AP Model schools for the academic year 2016-2019: With an objective to provide free and quality education in Andhra Pradesh, 155 A.P.Model Schools are established from this academic year by the Government in the educationally backward Mandals of Andhra Pradesh. All the Model Schools are having pucca buildings with necessary infrastructure These Model Schools are imparting education in ENGLISH MEDIUM from class VI to Intermediate with state syllabus. There are no fees in these schools. All these schools are having sufficient Post Graduate Teachers to impart education at Intermediate level and are having well equipped laboratories. Special coaching is given for EAMCET/IIT. Special bridge course is being run for the purpose of students who have come from Telugu medium schools. Students are expected to attend the schools from their homes. The students have to make their own arrangement for transport from their homes to the school. Applications are invited for admission into first year Intermediate course for the academic year 2019-2020 into BIPC, MPC, CEC and MEC groups form the eligible SSC passed candidates. Candidates who desire admission have to pay registration fee of Rs.100/- (Rs.50/- for SC/ST). Admission into first year Intermediate course shall be based on the marks/grades scored in the SSC examinations in the order of merit strictly according the provisions of GO.Ms.No.17 School Education(SE-PRG.I) Department , dt. 11-02-2013 read with GO.Ms.No.22 School Education (SE-PRG.I) Department ,dt. 29-04-2015. However, in case of any non-availability of applicants in any particular group, the total strength of 80 can be taken as a unit for the purpose of reservation. While admitting the students the Group shall be taken. There shall be no income limitation to the parent/guardian of the student. But preference goes to the student hailing from less income (annual income). 1. Candidates who wish to get admission in A.P.Model School pays registration fee for admission of Rs.100/-(OC & BC) or Rs.50/-(ST/SC) in A.P. online centers. 1. The Principal prepares selection list strictly in accordance to the provisions of GO.Ms.No.17 School Education(SE-PRG.I) Department ,dt.11-02-2013 read with GO.Ms.No.22 School Education(SE-PRG.I) Department ,dt.29-040-2015. 2. Submits selection list to the District Selection Committee under the Chairmanship of the Addl. Joint Collector for final approval. 3. The approved selection list will be published in the office of the District Educational Officer and in the notice board of the Model School concerned. 4. Verification of original certificates of the selected candidates and admission process will be taken as per the admission schedule on the specified dates. 5. The model admission application form to be up loaded online and the list of district wise A.P. Model Schools is given here under for guidance. The actual format of the application form under development of A.P. Online may vary this format. The basic contents of the application form are given here under to keep the required documents ready for filling up of the admission application form.